Fathom sent Emily Warman, a skeptical NYC editor, to Virginia to discover what all that old-fashioned Southern charm is about. 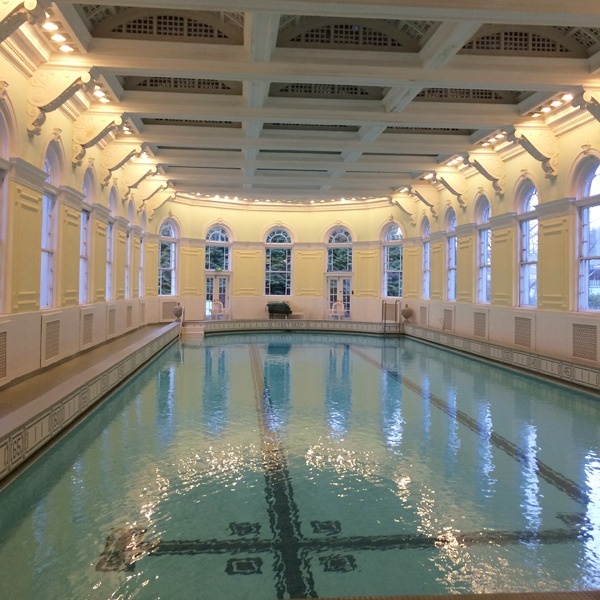 SHENANDOAH VALLEY, Virginia – When Fathom sent me on a road trip with five other twenty-ish travel writers to discover the hidden gems of Virginia in the beautiful Shenandoah Valley, I was tentatively optimistic and curious. The hosts had pre-billed these "gems" as "old-school" and "nostalgic." But how could you be nostalgic for places you've never been? Answer: When the towns you visit are so achingly authentic and adorable you start to miss them when you're already there. 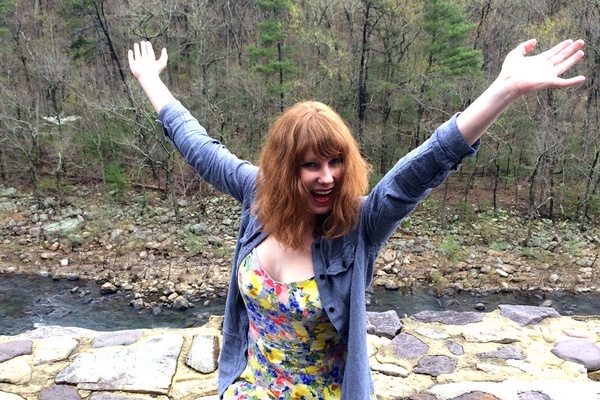 My travels from Staunton to Lexington to Roanoake were, in fact, so old-school and nostalgic that I felt wholesome during my trip — not my typical style. Another bonus: People from Virginia are really, really nice. We drive from the Roanoake-Blacksburg Airport (ROA) to Staunton, a pretty drive supplemented with views of the Shenandoah Valley. Lunch is at Depot Grille, which is located in an old freight depot and is the kind of place that automatically puts slices of lemon in your water. It's unfussy and unpretentious, a solid casual eatery with great burgers. 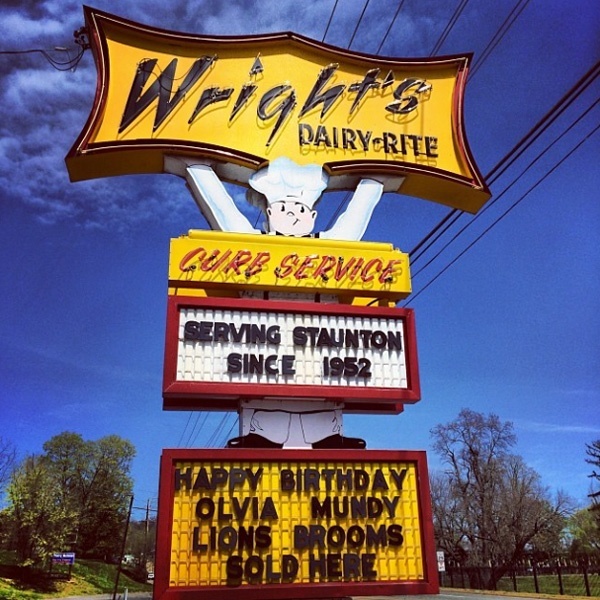 From there, we stop for dessert at Wright's Dairy Rite (346 Greenville Ave., Staunton; +1-540-886-0435), an original drive-thru that's been kicking around for more than 50 years. I Instagram the iconic sign, order a soft-serve, and sit outside, right across the street from an old mental institution. This makes for interesting conversation. We continue to the Red Brick District, a pretty downtown area that feels straight out of the 1950s, homey shops and all. Like Black Swan Books and Music, with its eclectic collection of books and vinyl. I'm tired by now, but since I love my mother, I stop by Sunspots Studio and make her a glass-blown ornament. The artist-in-resident does most of the work, but my precious breath is trapped inside forever. Is Southern charm contagious? I check in and nap at the Stonewall Jackson Hotel, which discretely murmurs "Southern hospitality" and is within walking distance of everything I want to do. Dinner is at Zynodoa, which somehow manages to feel both quaint and trendy, due to urban decor and Southern cuisine primarily sourced from the Shenandoah Valley. We end the day with a nightcap on the roof deck at The Pompei Lounge. 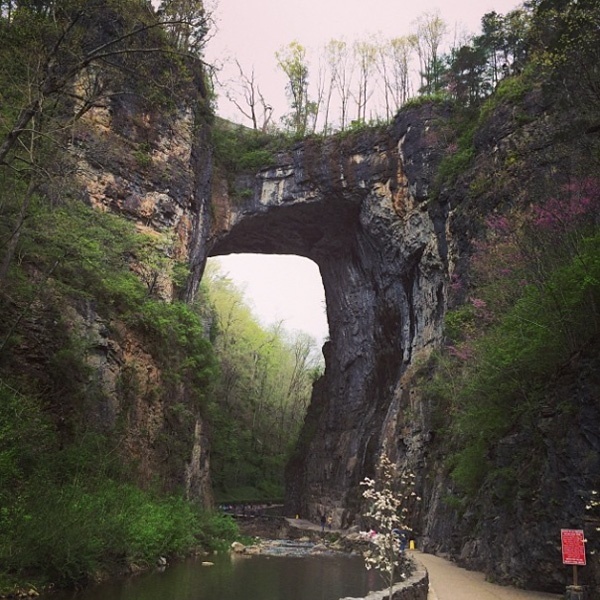 After a quick buffet breakfast at the hotel, we head south to the Natural Bridge in Rockbridge County, a national historic landmark billed as one of Seven Natural Wonders of the World. 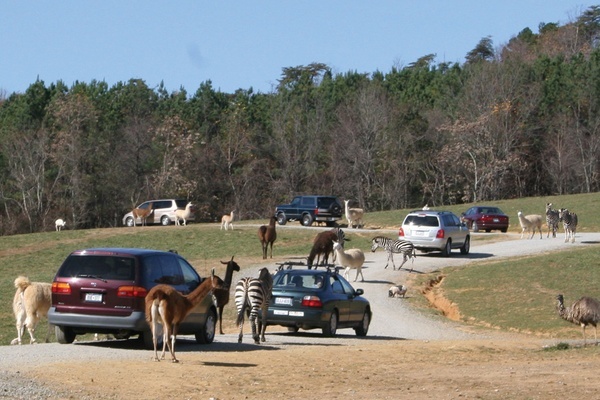 Now it's time to get wild at Virginia Safari Park, which is essentially a drive-thru zoo. It sounds like an awful tourist trap, but stay with me: This is the most fun we have. We grab some feed (ask for extra buckets, as the camels tend to steal them) and drive into the animal reserve. Pretty soon enormous bison, elk, camels, llamas, and more press their slobbery noses against our car and attempt to inhale whole buckets of feed. It's thrilling, ridiculous, and a little scary. I scream the whole time like a hysterical teenage girl, and I love it. Warning: Your car will get very dirty. So what. Our next stop is Lexington, home to the Virginia Military Institute. We see many young cadets walking around the quaint downtown area. It's not a bad look. We decide to go full-tourist and take a picturesque horse-drawn carriage ride. 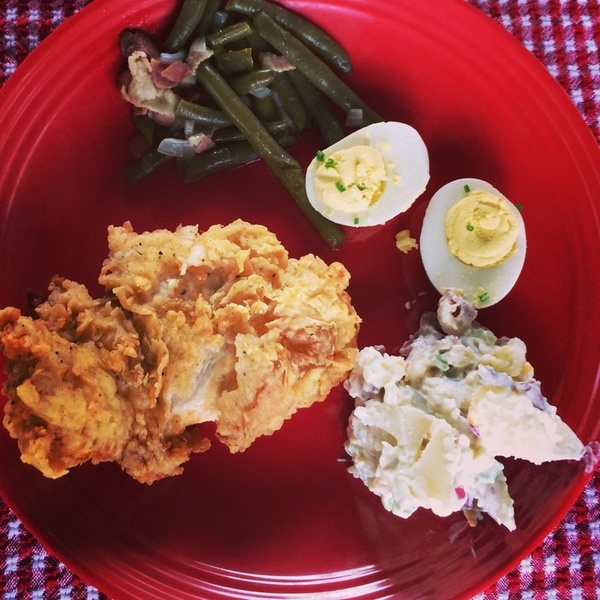 For fuel, we order fried chicken and biscuits at Southern Inn, figuring we need a good base before stopping by the Devils Backbone Brewing Company. 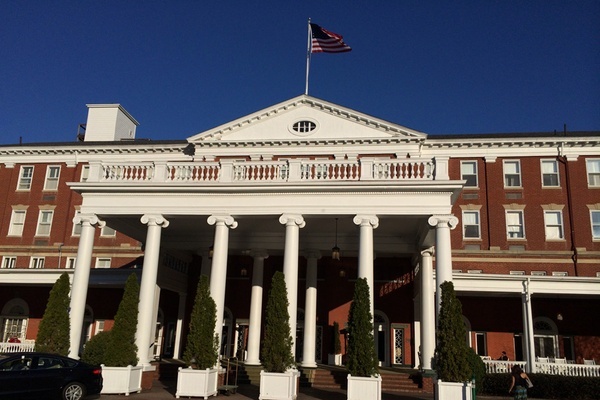 It's a two-hour drive to The Homestead Resort, a hotel that has more history than most states. 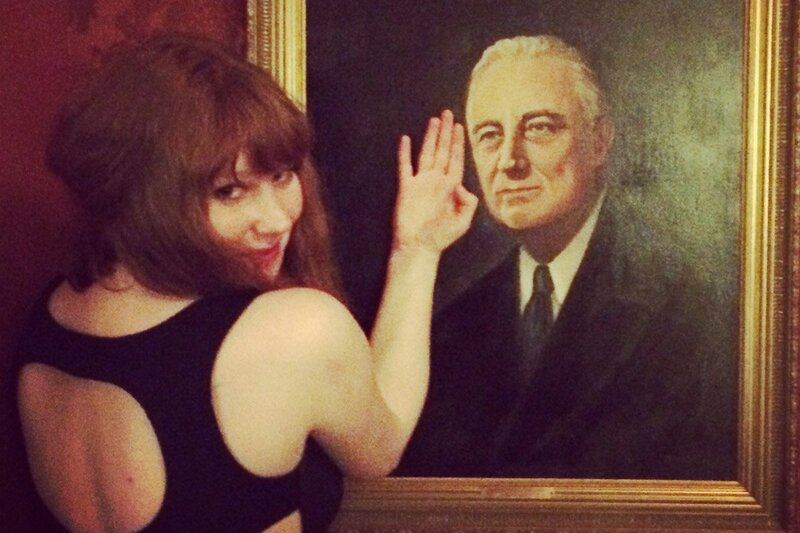 To wit: 22 presidents have stayed there. If you're counting, that's half of them. We have dinner at the casino restaurant on the property, which is low-key, filling, and decidedly less stuffy than the main dining room. After dinner, we have a glass of wine (that is, three) at the hotel bar, a stately room filled with portraits of all the presidents who have rested their heads in these rooms. Brunch in the main dining room is opulent but casual during the day. And speaking of history, the woman who runs the omelette station has been working here for decades. 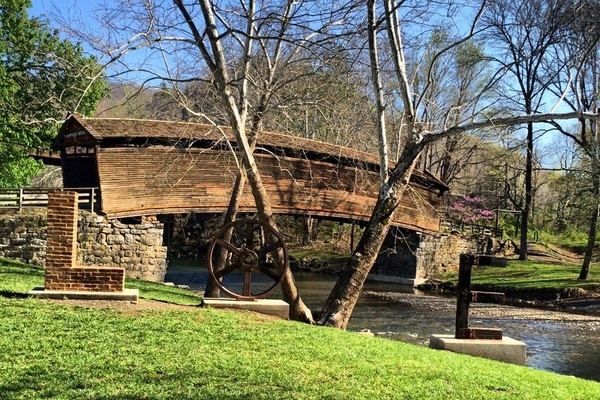 We up the scenery ante at Humpback Bridge, the oldest covered bridge in Virginia. I have a cup of coffee, ponder the "Love" sign, and have a quiet moment. We keep moving. (This is a road trip, after all.) Roanoke is our next stop, off I-81 and the Blue Ridge Parkway. We wander around City Market and visit the Butterfly Habitat before settling down outside with a local beer to enjoy live music, a regular occurrence around town. Lunch at Local Roots lives up to its name: The buttermilk fried ramps were personally foraged by our waitress. Nearby Pop's Ice Cream and Soda Bar is a local staple. The line winds around the block, and we're happy to wait on it. Hotel Roanoke is our destination for the night, and we're lucky to be checking in on the same night the hotel is hosting the local prom. The prom! We're tempted, but we don't crash it, which is a good thing because that would have meant missing the best roast chicken I've ever had at River and Rail, yet another farm-to-table restaurant. Ordering the chicken is usually an amateur move, but the smart order is on the bird here. After dinner, we hit the scene in downtown Roanoke — and couldn't help notice the disproportionate number of clubs and scantily clad ladies. Yee-haw. Recovery comes in the morning via hangover biscuits with sausage gravy at The Roanoker Restaurant. And with that, we're out. I leave having felt truly, unironically, and very happily Southern for a weekend. Emily is an editor at Tasting Table and a lover of giant dogs and sharp cheddar. You can find her at @thewarmanstory on Twitter and @EmilyWarman on Instagram. She travels for the people she hasn't met yet.